One way to figure out what size and color pattern to use on a particular day in a particular water is to pick up submerged rocks and match the most prevalent nymph you find. You can also examine the contents of a fish's stomach to find what kind of nymph the fish are eating that day. Of course, you have to catch a fish first to do that. These flies imitate baitfish, and are tied on long-shanked hooks to enhance that appearance. The streamer has a long wing made of feathers, which is attached to the hook just behind the eye and extends along the top of the shank. Some streamer patterns have tails as well. Bucktails are streamers that have wings made of the long hair from a deer's tail, which may be dyed yellow or red, or left in its natural brown-and-white coloration. 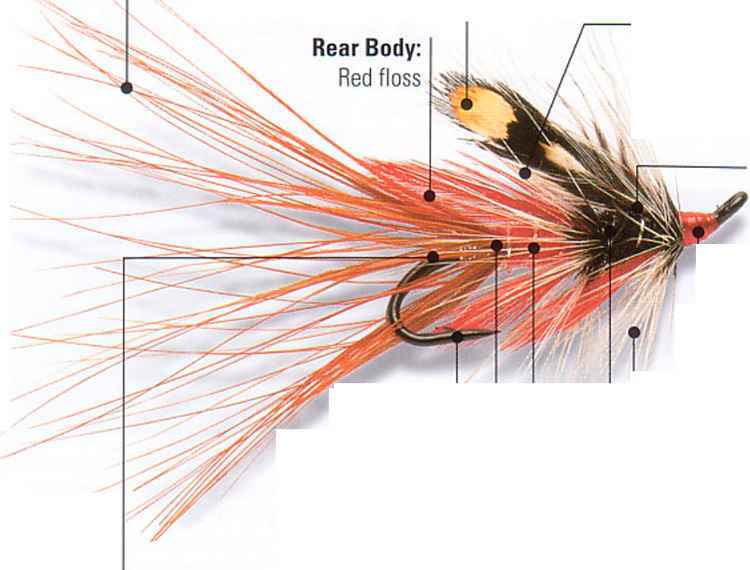 Most streamer and bucktail patterns have a body, usually a sparsely tied one consisting of a single layer of yarn or tinsel. Some streamer patterns imitate actual baitfish speciessuch as the Black Nose Dacewhile others resemble nothing at all, with improbable color combinations and oversized eyes. These attractor patterns are meant to induce strikes through their flash and vibrancy.